everything seemed to work as expected, with one exception. And that was the WDS map acquisitions. I could acquire video images, and even stage or beam maps using the VS1 or VS2 signals, but the WDS intensities in the x-ray maps were either 0 or very large integers. And lo and behold it worked! I now have nice looking x-ray maps! 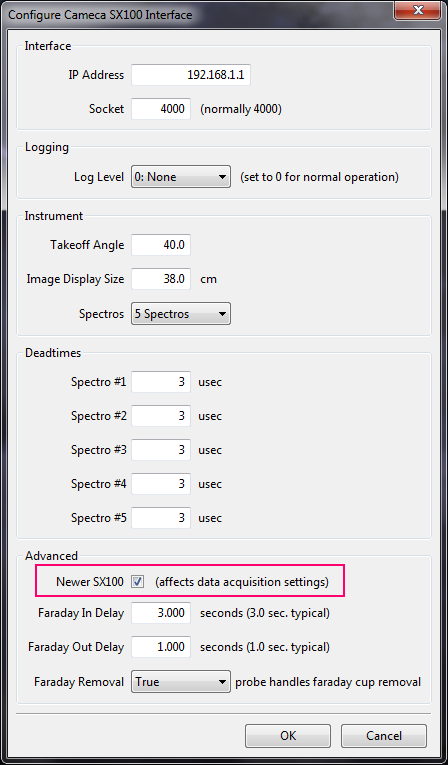 Now the story of that little checkbox is that when Probe Software started interfacing to the first SXFive instruments (Adelaide and Madison), we found that the WDS data coming back from the instrument was in a slightly different format. So that little checkbox was created to deal with what we thought was a change in the map acquisition hardware for the SXFive. But apparently, it's not due to a change in the hardware, because the hardware on my SX100 instrument hasn't been changed, just the PeakSight software to was updated to v. 6.2, which by the way, contains updated firmware! 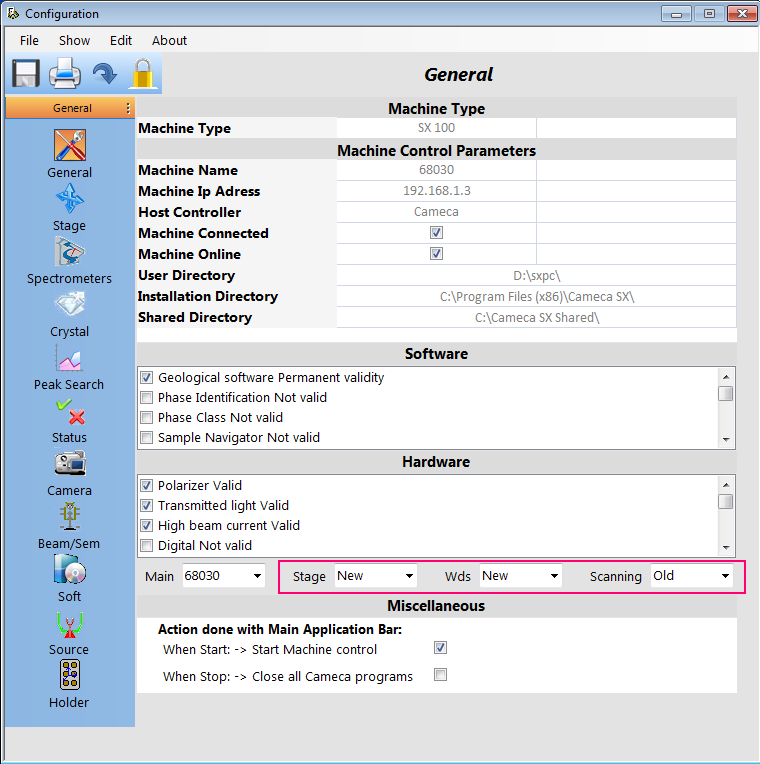 So, this little "Newer SX100" checkbox in the probe setup dialog in Probe Image is actually for when your firmware gets updated to the latest Cameca firmware. Apparently this firmware is already updated for all SXFive instruments, but is also updated when going from v. 4.x of PeakSight to v. 6.2 on SX100 instruments also. I just learned from Cameca that the reason I cannot acquire x-ray maps in Probe Image *or* PeakSight (after I updated last summer to PeakSight 6.2 because I had to retire my old Cameca XP computer), is that the new firmware (which comes with PeakSight 6.2) is not compatible with my older SX100! Waiting to hear back from them on how the instrument can be modified to work with the newer firmware! Depending on the "vintage" of your SX100, it might be OK. Originally when I first reported these x-ray mapping issues to Cameca, they assured me that they had updated dozens of SX100s to PeakSight 6.2 and not seen any problems. I'm assuming the "Old" scanning board must be the issue, but I'm not sure. What does your configuration page look like? The most notable difference (to me) is that my file shows "Scanning | New", whereas yours shows "Scanning | Old". I am still leery of moving to PeakSight 6.4. Right. If I had to guess I'd say you would be OK (with PeakSight 6.2 at least), because you have the "New" scanning board, but you definitely would want to confirm that with Cameca before you update! Everything else worked fine with PeakSight 6.2, I just had to check the "Newer SX100" checkbox in Probe Image to get the intensities back OK. But after the x-ray map finishes, the spectrometers won't move and the instrument has to be re-booted.